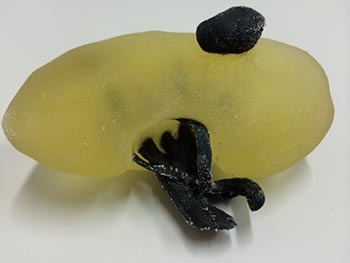 Using 3D imaging and printing technology, surgeons from Kobe University in Japan have created scale replicas of patients’ kidneys to help prepare them for difficult kidney cancer surgeries. The transparent models allow doctors to see the location of tumors as well as blood vessels within the kidney. When the actual robotic surgeries are performed later, surgeons can work more quickly and accurately in a smaller area and can shut off blood supply in the region for a shorter amount of time. 3D printing, kidney cancer. Bookmark.